Welcome to the Articles section! Hello and welcome to the articles section! Here is the perfect place for you to put up some instructions, tips, tricks, and more! Also, members are welcome to use the Web Archive snapshot of our former Articles section to recover and potentially resubmit older articles. If you resubmit an article from the old Articles section that was created by another user if they do not submit it themselves, please credit them in the title and first line of the new article. For the curious, article creation is permission specific. If you have any questions, please PM one of the moderators. Split ends are sometimes caused by rough or inattentive care. This article offers tips, hints, and ideas to help raise your awareness of how you are treating your hair. Here is the advice I have to offer. There are several other aspects of hair-handling that you might not even pay attention to, that can make a big difference in the quality of your hair/ends. Become aware of how you are handling your hair (or not handling it). Awareness is the first step. Day-to-day handling is where most of the damage occurs. 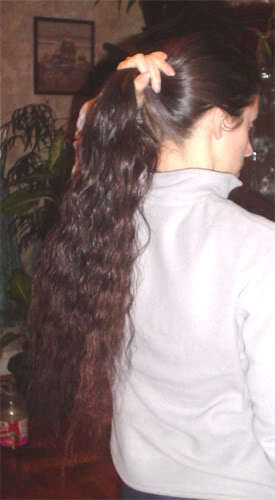 Is your hair long enough to get caught under coat collars or under shoulder straps (for Messenger bags, back pack, etc)? If so, move your hair before putting on that bag. Does your hair whip in the wind? Wind knots up hair. Knots damage length. Damaged length causes more splits. Eventually the damaged length splits. Restrain your hair when you are going to be in a lot of wind. Washing your hair. Do you pile your hair on top of your head when you shampoo? This creates MANY opportunities for splits. Shampoo really only needs to be applied to your roots. That's where the grease/oil is. Personally, I condition the length of my hair, apply shampoo to my scalp (down to ears), rinse, then apply conditioner again, rinse. This is called CWC (Condition Wash Condition). All the while, the length of my hair just hangs down my back. When you dry your hair, do you scrub your scalp with a towel? It feels great, but it will rip, strip, pop, snap and fry your hair in no time! Many of us use some sort of a turbie type towel/turban for drying our hair. Others put a towel on their back and let the hair drip onto the towel. Do you blow dry your hair? The heat and the wind created by the blowfryer (no that isn't a typo) really damages hair, too. Any heat styling tool can potentially damage hair. If you feel you must use them, keep the temperature low and exposure time to your hair short. How often do you shampoo? Regardless of HOW you shampoo, how OFTEN do you do it? Many of us have found that 2-3 shampooings per week is sufficient. It takes a few weeks to train your scalp to have fewer washings, but it helps protect the ends. Not everyone has success with fewer shampooings, though. Do you use conditioner or a cream rinse when you shampoo? My personal belief is, if you want long hair you need to condition it EVERY time you shampoo. If nothing else, it helps detangle my hair. You also might consider using a leave in conditioner, especially one that helps detangle (and gives “slip”). You can oil the length of your hair daily. Many long hairs do this. They put a small drop in the palm of their hand, rub their hands together and lightly apply the oil to the ends only of the hair. There is an abundance of oils that you can use, some are quite exotic. Extra virgin olive oil (EVOO) is probably the most common, but there is a long list of oils everyone has tried and ones that each person likes/doesn’t like. After you've shampooed, when/how do you brush/comb your hair? Generally, brushing wet hair is bad for the hair. Hair is most delicate when wet. Brushing tends to stretch the strands. Stretching the strands puts wear and tear, which causes damage, which causes splits. If you comb your hair, then what type of comb do you use? Does your comb have rough seams and burrs? They catch, scrape and rip hair in nothin' flat! I only use combs that are hand-cut (saw-cut) from one piece of plastic, as opposed to one that is poured into a mold and popped out. There is a DRAMATIC difference in the feel of the hand-cut comb vs. the molded comb. Some people have the best success with finger-combing (literally using their fingers only for coming their hair). When you brush or comb your hair, whether it is wet or dry you need to always begin brushing/combing at the ends. Go up about 3-4 inches, brush/comb from there to the ends, move up some more. Continue the process. Never rip through knots. Treat your hair like antique lace. What about those existing splits! To trim splits (or to cut hair) you need a good pair of HAIR scissors. You can buy some at Sally's. They come in ALL price ranges. Whatever you do, use these scissors ONLY for hair. Using scissors for anything else will damage the edge, which will cut the hair poorly, which will cause splits. Then, trim the split, above the split. Cut the split perpendicularly to the hair. Think of the capital letter T . The upright part of the letter is the hair, the cross bar is the scissors. My personal belief is that an al- over trim (of so many inches) will not take care of a split end problem. Many splits and damage occur above the last inch or so of hair. If your hair is so split that the splits can be seen by a person standing 3 feet away from you, then, yes an overall trim will benefit you. Otherwise, work on how you are handling your hair and trimming off individually damaged hairs. If you feel you “have” to get an overall trim, then get a 1/8 to ¼ inch trim. Seriously! That little amount can make a world of difference in how your hair feels. Trust me, I’ve gotten 3 inch trims that feel no better than 1/8 inch trims (except the 3 incher FELT shorter and made me sad). I go to a barber shop to get the really short trims, and it costs next to nothing! I like that! When you begin trimming splits, it can seem a daunting task. Many people notice “more splits” when they begin trimming them away. I personally think this is because you are more aware of them and not that there are more. Hang in there. Where should you trim the splits? I prefer to do it right here in front of my computer, with the lights off, as long as I’m on a page with white back ground. This really helps the splits stand out. My second favorite place is outside in indirect sunlight. I also think my splits are “plumper” if I trim them a few hours after I’ve washed my hair. I think the water stays in the split, plumps it up and makes it easier to see. If your ends still feel awful after you’ve been treating them gently, then you might need to use some sort of a clarifier (shampoo, rinse, conditioner). That's another long thread! LOL There are several ways to do this. You also might consider deep conditioning your hair periodically. Hot oil treatments can help, also. There are some in depth conversations on how/when/where/why etc on these topics, so I won't address them right now. Well, I guess that's all of my sage advice, for now . . . . Instructions on how to tie a braid with a ribbon by braiding it in.